Mashabe said #AReSebetsengGauteng will now seek to broaden the spirit of community volunteerism to Tshwane and Midvaal Local Municipality. 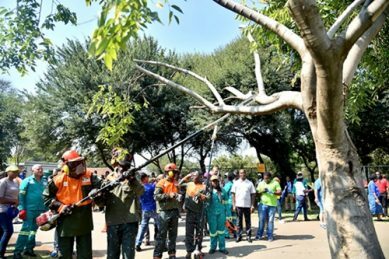 City of Johannesburg Mayor Herman Mashaba was today sweeping streets, pruning trees and painting roads marking in Soweto. Mashaba was accompanied by the City of Tshwane Mayor Stevens Mokgalapa, and Midvaal Local Municipality Mayor Bongani Baloyi. They were launching an expansion of the monthly A Re Sebetseng volunteer clean-up campaign to the municipalities of Tshwane and Midvaal. A Re Sebetseng was first launched in Johannesburg in August 2017. Mashabe said #AReSebetsengGauteng will now seek to broaden the spirit of community volunteerism to City of Tshwane and Midvaal Local Municipality, and hopefully, across Gauteng. “I truly believe that #AReSebetseng has the potential to not only change the face of Johannesburg but to also inspire the nation. I look forward to the partnership between the municipalities of Joburg, Midvaal and Tshwane in helping to build cleaner, safer and more connected communities. The people of our respective municipalities will benefit from our collaboration as we ensure the spirit of volunteerism transcends municipal boundaries in Gauteng,” said Mashaba. Mashaba said #ARESebetsengGauteng aimed to be a non-partisan campaign, bringing together individuals from different communities, works of life and beliefs. He said that they hoped many other municipalities would have heeded their invitation to join this great initiative. “We hope that as the initiative grows from strength to strength, many more municipalities will come on board”. He said since the inception of the #AReSebetseng, close to 28,000 bags of waste have been collected and approximately 21,500 residents have participated across the City through this community-led initiative. “We have seen various communities don gloves and Pikitup bags to clean their local street or public space. 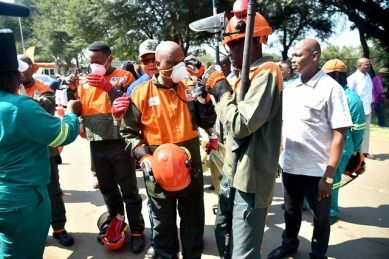 It has been nothing short of inspiring to see residents take ownership of their environment, assisting the City to keep our public spaces clean and safe,”said Mashaba. Mashaba said they have received pledges of support for #AReSebetseng from many organisations that share their goal of taking ownership of one’s surroundings. These include, among many others, the South African National Taxi Council (Santaco), the University of Johannesburg, Coca Cola, Avis Fleet, and Interwaste. In partnership with Adcock Ingram Critical Care and Netcare, the City assisted schools in providing 1,000 school shoes, made from recycled plastic, which were handed over to the children of Masakhane-Tswelopele Primary School in Zandspruit last year. Midvaal Local Municipality Mayor Bongani Baloyi said: “This volunteer campaign is critical to bettering community participation not only in keeping their respective environments clean, but also to encourage active citizenry. We want our residents to use their platforms to create the change they want to see. I am excited to start the roll out of #AReSebetsengGauteng across the Midvaal Local Municipality”. 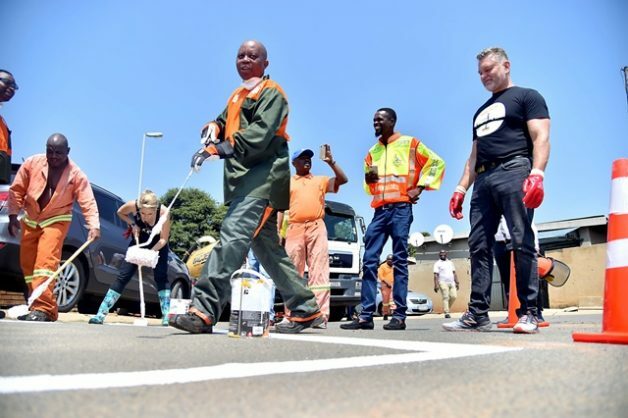 City of Tshwane Mayor Stevens Mokgalapa said the City of Tshwane has always encouraged environmental awareness and getting communities to take charge of keeping their neighbourhoods clean. “In June 2018 we launched a Tswelopele Clean-Up Campaign which attracted volunteers from around the city and multiple sponsors at inception. It is against this background that we decided to join hands with our peers and adopt the #AResebetseng brand going forward so that we can collectively keep the Province of Gauteng Clean,” said Mokgalapa.